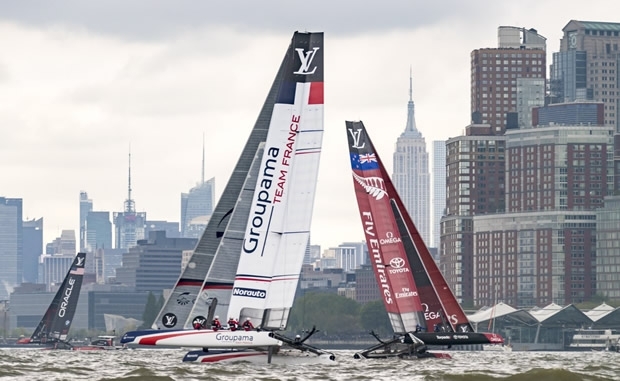 They tried and tried, but race management couldn't get a result in during the official race time slot for the first day of the 2016 Louis Vuitton America's Cup World Series New York. Despite their efforts – and at one point starting – to race, the powerful tidal current of the Hudson River overcame the weak breeze and forced every one to be abandoned. A promised late improvement in conditions didn't arrive in time to save the official day's racing, but the meteorologists are promising better for tomorrow. The Hudson River proved every bit as tricky as the sailors and pundits had predicted. The single race that did start saw all but one boat pushed over the line early by the tide, and half the fleet unable to make it to the first mark against the current. The team sometimes see similar conditions at home in the Solent and Land Rover BAR looked comfortable, holding second place when the race was abandoned. Land Rover BAR lie in third place overall in the 2015-16 ACWS after winning this year's first event in Oman back in February – the only team to have won two ACWS events in this Cup cycle. The team are just one point behind Oracle Team USA and seven points behind Emirates Team New Zealand in the overall standings. A race – designated as a 'substitute' – was held after the official time elapsed. This was won by Softbank Team Japan, but it will only be scored as part of the ACWS if there is no further racing on Sunday. Land Rover BAR were fifth after a starting penalty, in a tight race with lots of lead changes. It bodes well for the action tomorrow with a much more promising forecast for 15knots of wind. Ben Ainslie, Skipper and Team Principal commented: "It was a tough day for everybody today, the only full race of the day was a substitute race and unfortunately we had a boundary penalty before the start, so despite having a really good start that put us at the back of the fleet. They were very difficult conditions, so it was a frustrating day but at the same time it was awesome to be out on the harbour and see so many boats and spectators on the shore. We're really looking forward to getting some decent racing in tomorrow."